Few producers offer so few products as the Schmitt family in Bergbieten. The list includes a mere 4 wines despite an annual output of 45 000 bottles from 10 hectares. It has long produced classic Riesling from Lieu-dit Glinzberg and from Grand Cru Altenberg de Bergbieten, Vielles Vignes and Cuvée Roland. But in 2007, an Riesling Thalberg was launched, and we now await the first wines from a newly purchased parcel on Grand Cru Engelberg in Dahlenheim. 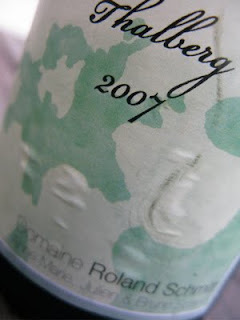 2007 Riesling Thalberg has, after 18 months of development in the bottle, a complex aroma of lime, white flowers, nuts and passion fruit. The flavour harmonises perfectly with the aroma and is bone dry without being harsh, and it is rich without being the least heavy. A model wine from a sympathetic producer who always who never disappoints. Price: € 8.40.